More than one hundred students from the five countries Austria, Bosnia and Herzegovina, Croatia, Slovenia and Hungary have been asked write an essay about the topic “My Homeland – Your Homeland”. What has been written is not just a mere summary of data and facts about their country, but a sensitive, deep, and often critical reflection of their homelands, their regions and their towns. Although all the students live in a contiguous area, the descriptions reflect the positive diversity of cultures and environments of the European Regions. This publication was published within the EU-project «Lucky Four Leaf Clover». The title is available in paper format (152 pages, 10,00€). Send your order. 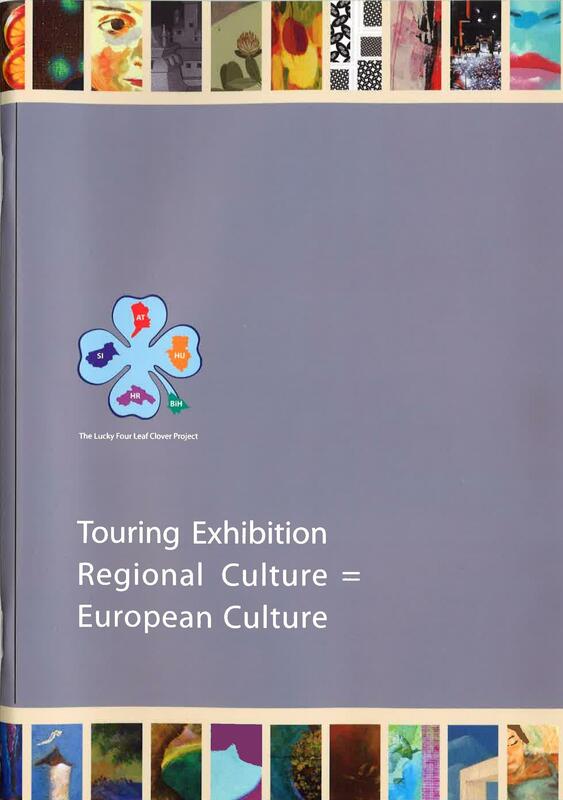 The touring exhibition «Regional Culture = European Culture» was part of the EU-project «Lucky Four Leaf Clover». Regional artists from Austria, Hungary, Slovenia, Croatia as well as Bosnia and Herzegovina presented their masterpieces. The goal was to strengthen the mutual understanding of various regions of the mentioned countries via regional art. In order to get to know the expressive power of the regional artists, the exhibition was presented in every region of the project area. The exhibition catalogue is available in paper format (7,00€). Send your order.